"A Life in the Shadow of the Power"
Ippolito de Medici was born as an illegitimate child probably on March 23, 1511. His mother was Pacifica Brandani, the daughter of Giovan Antonio Brandani, and died only few days after the birth. His father was Giuliano de Medici, a member of the influential family from Florence which lived in exile at this time. 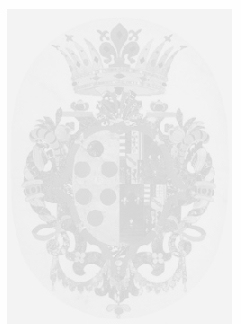 Because of social reasons it was not possible for Giuliano to stand by his child (it is also assumed that Pacifica Brandani was married with another man at that time) and he decided to give the child into the care of the brotherhood Santa Maria di Piano where he was called Pasqualino. A few days later he came to foster father called Bartolomeo from Monteguiduccio near Urbino. But the little Ippolito remained there only for a brief time when the reputable notary Lorenzo Spaccioli (possibly on behalf of Giuliano) took over the custodial care. When pope Julius II appointed the Medici family in Florence again the second Renaissance for the family began. 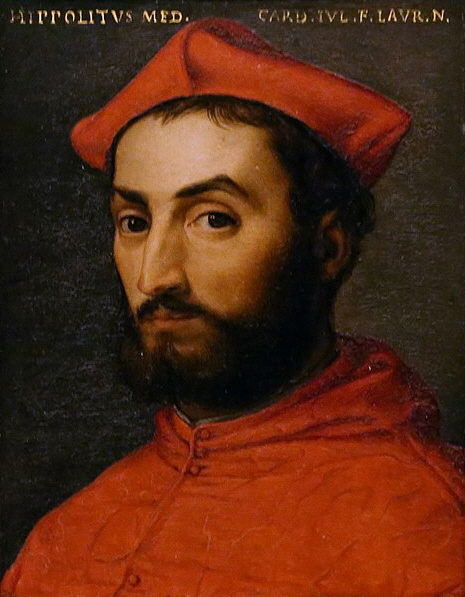 When pope Julius II died in 1513 his follower became Giulianos brother Giovanni de Medici who called himself pope Leo X.
Ippolito de Medici was brought to Rome where he soon became a well-welcome guest in the antechamber of the sanctums of pope Leo X. It followed a time of affluence and Ippolito enjoyed a considerable education and became a cultured but also ambitious young man. 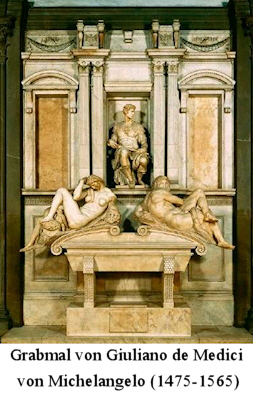 In those years he got in coutch with the most important personalities of that time, among others he was portraied by the painter Raphael, moreover he als met the sculptor Michelangelo when he was creating the tomb for his father Giuliano who died in 1516. This tomb is still existing. In later years Ippolito cultivated contacts with Leonardi da Vinci. Es folgte eine Zeit des Überflusses und Ippolito genoss eine umfangreiche Ausbildung und reifte zu einem gebildeten aber auch ehrgeizigen Jungen heran. In diesen Jahren traf er mit den Grössten seiner Zeit zusammen, u.a. wurde er vom Maler Raphael in einem Bild festgehalten, zudem traf er den Bildhauer Michelangelo, als dieser für seinen verstorbenen Vater 1516 das Grabmonument erstellte (dieses existiert auch heute noch). In späteren Jahren pflegte er Kontakt mit Leonardo da Vinci. His third cousin Caterina de Medici became later the queen of France and went down into history with the notorius St. Bartholomew's Day Massacre. The life of Ippolito became unsure when pope Leo X died in 1521 and the German Adrian von Utrecht became the new pope as Hadrina VI. But the curatorship was only short duration when he already died in 1523. It should last 455 years till the next pope was not an Italian (Pope Johannes Paul II). The new pope became Giulio de Medici, a near relative of Ippolotos father who also renewed the power of the Medici family as pope Clemens VII. Ippolito on his part could return to the Vatican. 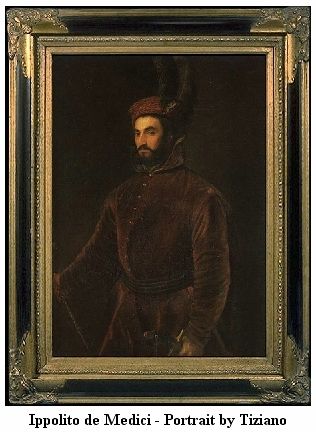 In 1524 Ippolito de Medici was delegated to Florence where he governed the city cabinet together with Silvio Passerini in order zu prepare him for future important functions. With his appearance on the political stage he also became a target of denunciation of envy opponents and soon his illegitimate birth was part of the rumors. The idyll became destroyed in 1527 when adverse troups attacked Rome and forced the pope to flee. During this attack 147 Swiss guardsmen were killed and the day went down into history as "Sacco di Roma". In memory of this 6th May all new Swiss guardsmen take their oath at this day. 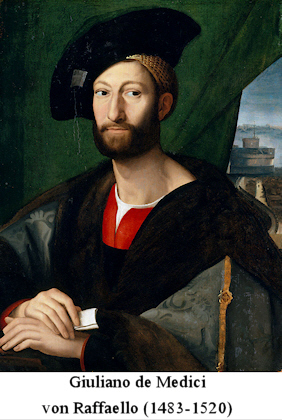 The Medici family was banished from Florence a second time, Ippolito went together with his following to Parma. When the conflict mitigated again, pope Clemens VII returned to Rome and Ippolito followed him. But the pope fell ill seriously and in order to save the family interests he persuaded Ippolito to take over the cardinal's hat and in January 1529 Ippolito was ennobled to this position. In 1531 it became apparent the the power in Florence will change and Papst Clemens VII planned his illegitimate son Alessandro for this position. But also Ippolito fancied with this position and he tried to seize the power. When Alessandro was in Spain, Ippolito rode with his people to Florence. But the negotiations with the pontifical proconsul Nikolaus Schönberg failed and Ippolito de Medici had to return to Rome without achived anything. In order zu reassure Ippolito, pope Clemens VII awarded him with several functions, among others he became vice chancellor of the Holy Roman Church on July 3, 1532 and as the legate of the Hungary campaign he started this campaing on July 8. In 1534 Ippolito planned again to take over the power in Florence. But his plans were undone because of the attacks of the Turkish admiral Barbarossa. When the pope became fell seriously ill again in 1534 Ippolito was bound to Rome entirely and after the death of the pope he expressed the plea in his will to the Spanish imperator that he should suppport his illegitimate son Alexxandro and arrange the wedding the Margherita of Austria. With this will an unfriendly takeover of Florence against Alessandro became impossible for Ippolito. 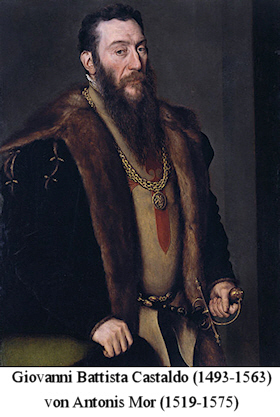 Still his hunger for power did not come to a stop and Ippolito de Medici tried as a substitute of the Florentine opposition to win the imperator Charles V for his interests. When Ippolito de Medici felt poorly during a stopover in Fondi in August 1535 on his way to Charles V they guessed malaria as cause. When the caretaker brought him a chicken stock and Ippolito had to vomit he shouted in the delirium that he was poisoned and that the Duke Alessandro de Medici had brought him to death. Hereupon the caretaker was tortured till he made a confession in order to stop the torture. But as soon as liberated from the torture he revoked his confession. Ippolito de Medici suffered several more days before he died in August 10, 1535. The historians today are at variance what really led to Ippolitos death. One theory indicates that pope Paul II let him poison, an other that Alessandro de Medici comes into consideration as agitator. The latter had some reasons for such an action because only two months before Ippolitos death it became known that Ippolito had planned an assassination to Alessandro de Medici by Giambattista Cibo. But also the possibility that Ippolito only died of malaria is conceivable. The bearer, his excellency Gio. Batta Castaldo*, is completely orientated about my sense for you. I am and will always be at your disposal for your service. But I won't waste too much words about it, in this regard you will hear more from Castaldo. Please give him, who speaks in my name, your full favour. Only to remember you. You will always and for each matter find me ready for which I can help you. I entrust my issues to you and hope to run across you propitious and gracious. I kiss your hand of offer my service. 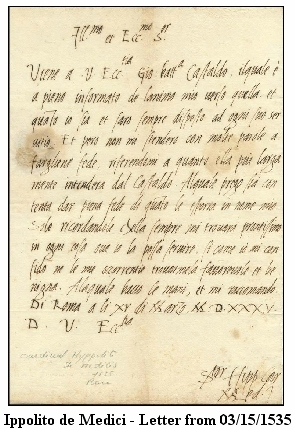 *The in this letter referred Giovanni Battista Castaldo - Marquis von Cassano - was a captain of the royal army and took part among others in the battle of Pavia and at the combats in Piemont, Hungary. Furthermore he led the operation against the Turkies in Transylvania.